Despite improved access to dental care and better oral hygiene practices for most, tooth loss is common for adults living in the United States. Most people over the age of 35 have at least one missing tooth. If you, too, have at least one gap in your smile, do not hesitate to seek an effective replacement. Your dentist in Colorado Springs provides the premiere replacement option, dental implants, for eligible candidates. A dental implant is a small titanium post that takes the place of your missing tooth’s root. Each implant is surgically placed beneath the gum line. Over a period of three to six months, the jawbone gradually grows around the implant in the process known as osseointegration. 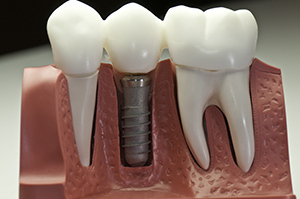 Once the dental implant is sturdy in the jaw, it is exposed once again and a healing cap is placed on top. The gums are given one more brief healing period, and then your dental team takes impressions of the jaw to create a sturdy new tooth replacement — either a single crown, a bridge, or a full denture. The prosthetic tooth/teeth attaches to abutments, which keep it sturdy in the smile. When cared for properly, teeth replaced with dental implants can last for a lifetime. Dental implants provide unsurpassed stability for your new smile, and the benefits of that are far-reaching. By taking the place of your tooth’s root, they stabilize the jawbone and give it the stimulation and blood flow it needs to stay healthy for decades to come. Other replacement options, like a fixed bridge or traditional denture, only take care of the visible tooth — and that means the jaw will gradually degenerate and lose its volume over time. Patients who still have some healthy natural teeth remaining in the gum line are more likely to lose them as well without an implant-retained option. No barriers to eating a balanced diet with a variety of food sources, like crunchy fruits and vegetables. There is no stress related to ill-fitting dentures. A tooth replacement that fits just like it should does not cause painful oral sores, which are common with traditional dentures. Remaining natural teeth continue to thrive. Oral hygiene remains strong because there are no special brushing or flossing techniques necessary with dental implants. You may think finding a tooth replacement isn’t all that urgent for the back teeth, but even your very last molar plays an important role in your oral health. Without each molar, you may have difficulty eating some foods — and a gap in the gum line encourages the surrounding teeth to drift out of place, causing issues in the bite alignment and also increasing the risk of even more tooth loss. A single dental implant is sturdy enough to replace a missing molar. If you are missing one, two, three, or a full row of teeth in the upper or lower jaw, dental implants in Colorado Springs may be the solution you need to smile with confidence once again. Find out whether or not you are a candidate for the replacement option today! Contact Anderson Family Dental to schedule an appointment.